This blog was written by Rui da Silva, Centre of African Studies of the University of Porto. For the 2017 UKFIET conference, 23 individuals were provided with bursaries to assist them to participate and present at the conference. The researchers were asked to write a short piece about their experience. I was honored to receive a bursary to attend the UKFIET Conference 2017. I presented a paper named Teachers´ support in challenging situations: reflections from a teacher professional development programme sustainability in Guinea-Bissau. This paper focuses on the experience of a bilateral educational aid teachers’ continuing professional development (CPD) programme in Guinea-Bissau. The focus was on the CPD of teachers in a context of protracted crises and fragility. This presentation allowed the conference participants the opportunity to discuss a country context that is not often discussed in conferences outside Lusophone countries. We were keen to understand how the implementation/application of the teachers’ CPD was sustainable and what the impacts on teachers were. 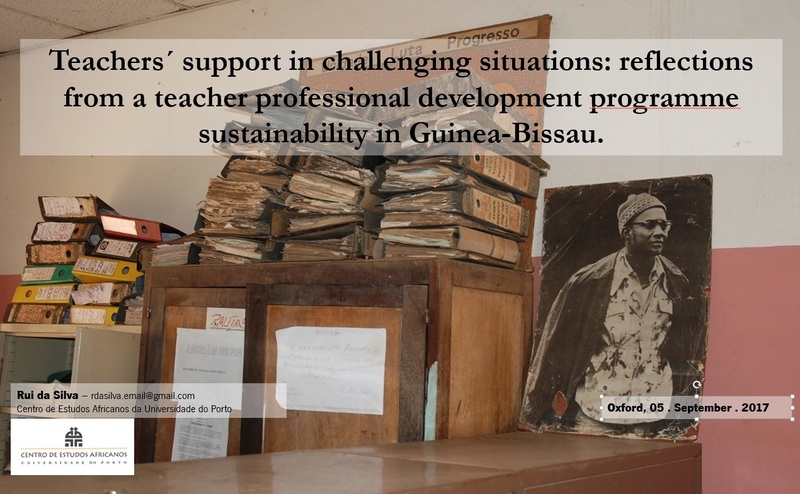 The teachers’ CPD programme reviewed is a long-term school-based programme (2002-2012) based on the experience of a bilateral educational aid programme from Portuguese Aid in Guinea-Bissau – PASEG [Aid Programme for the Educational System of Guinea-Bissau]. In the school year 2006/2007, PASEG started the first structured approach to the CPD of teachers with the development of Pedagogical Support Groups (Grupos de Acompanhamento Pedagógico). Up to the school year 2008/2009, teachers from Grade 7 to Grade 11 were involved and from school year 2009/2010 onwards, teachers from Grade 1 to Grade 12 were involved. The subjects covered in this CPD programme were philosophy (until 2011), physics, Portuguese language, mathematics, chemistry and biology. The CPD programme results point in the opposite direction to what has been commonly shown in similar contexts to Guinea-Bissau (Burns & Lawrie, 2015). This stems from the fact that the Pedagogical Support Groups attempted to provide opportunities for teachers to learn what is recommended in the literature and common in higher performance countries (Avalos, 2011). The CPD of teachers programme impacted on teaching practice, thinking and morale. The materials and textbooks produced played a major role as curriculum mediators. The inclusion of the lesson observations following the principles of pedagogical supervision is identified as a key factor for the implementation of the training content and teaching aids by the teachers. Some innovations introduced by the CPD programme such as: ICT, reduction of the timetable of the teachers to allow them to take part in the CPD programme, and schools-based training, can hardly continue without some kind of external support.